A Olympic Incline Bench is, and can best be described as follows: An Olympic Incline Bench is a free weight bench comprised of two vertical posts with bar catchers for holding and loading an Olympic bar or barbell, and an attached incline bench between them. 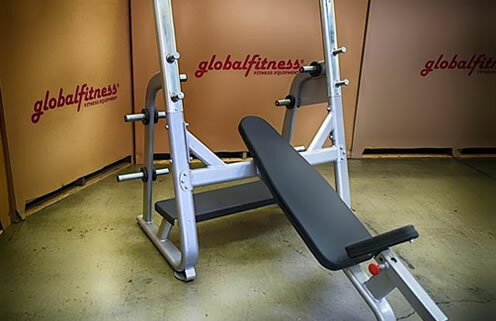 The incline bench is angled upward to elevate the shoulders and lower the pelvis, similar to reclining in a chair, and upper body exercises performed with it work the upper portion of the Chest and Deltoids. Some Olympic incline benches also come with plate storage systems.